We stopped for a visit with fourth-generation Webb family member, Atlee Frechette, at this year’s Pumpkin Patch located at the produce stand on Alpine Road in Menlo Park. As usual, there are 18 varieties of pumpkins to choose from, from maxi to mini, and colors that include red, white and blue, as well as the traditional orange. About 30% of the pumpkins sold are grown on Webb Ranch, including the stunning white Moonshine and Polar Bear (pictured). New this year is a fun growth chart — How Tall Are You This Fall? — created by Atlee that she says draws kids like a magnet. Also making its debut is a reptile zoo ($5) and a hay slide that’s free. Other $5 attractions include pony rides, petting zoo, hay ride, train ride, which are available only on Saturday and Sunday as well as Jumpy Houses that are open daily. For those who like things a bit scary, the Haunted House is free this year. 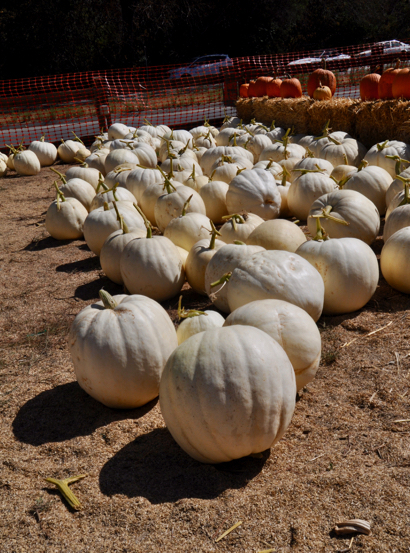 The Webb Ranch Pumpkin Patch is open daily from 10:00 am to 6:00 pm.